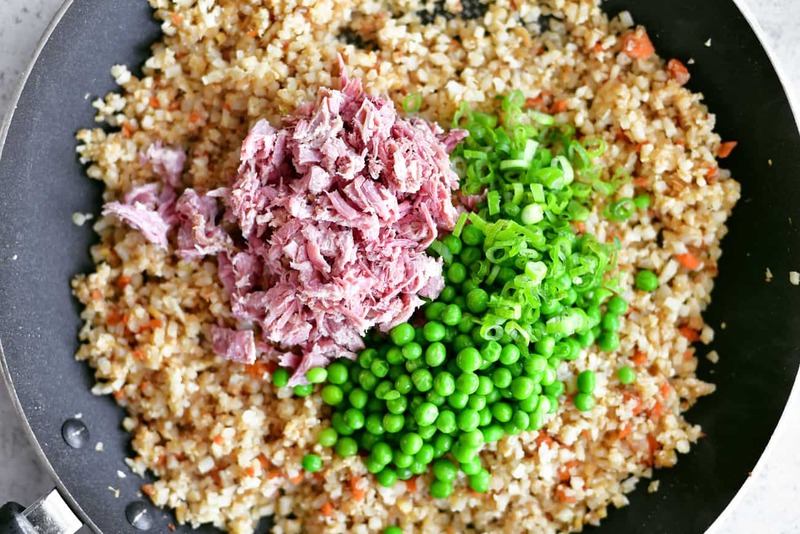 Pork Fried Cauliflower Rice is an easy low carb meal that is chock full of veggies! It’s so tasty your family won’t even miss the rice. We had some leftover pulled pork to use up and I remember my mother in law telling me that she uses her leftover pork to make pork fried rice. It is super easy to make and very filling. Don’t worry if you don’t have leftover pork or are short on time. I will share lots of options for shortcuts as well. 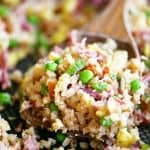 Where is the Pork Fried Cauliflower Rice recipe? In this post, I will share step-by-step instructions with photos for how to make this easy meal, as well as answering FAQs about the recipe and sharing a short video showing the recipe in motion. But you can go directly to the recipe by scrolling down to the bottom of the post. 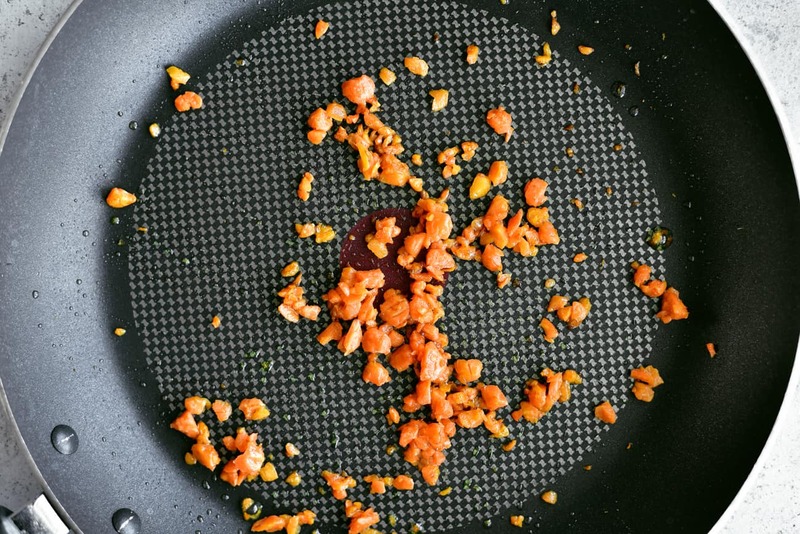 Start by cooking minced or chopped carrots in olive oil. You can mince or chop fresh carrots by hand or use a food processor. Or if you prefer you can use frozen or canned carrots instead. 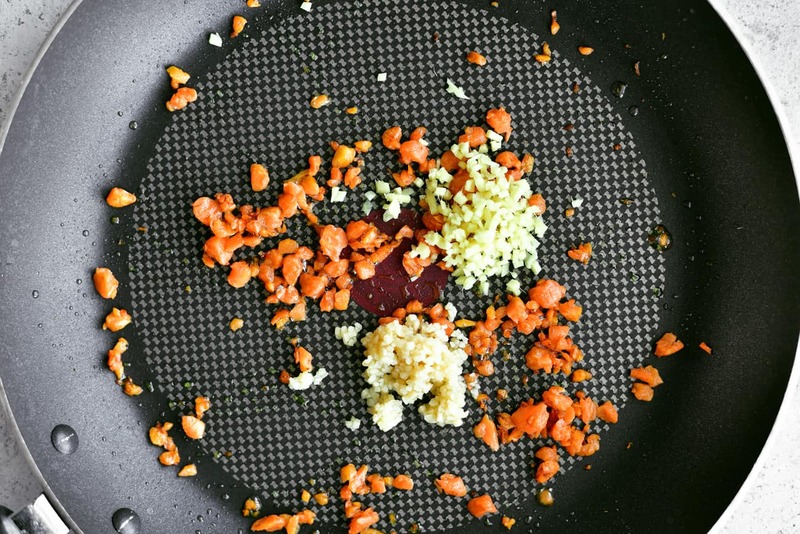 Once the carrots have softened, add some minced garlic and minced ginger. One of my favorite shortcuts is using this minced garlic but you can use fresh garlic powdered garlic. For fresh garlic, use four cloves. If measuring minced garlic, use two teaspoons. If you prefer to use dried minced garlic or garlic powder, use one teaspoon. Stir in the remaining olive oil along with the soy sauce and sesame seed oil. Then add the cauliflower rice and stir fry over medium heat. Here is my recipe for cauliflower rice if you want to make your own. Or as a shortcut, I would suggest buying frozen cauliflower rice and warming it up in the microwave before stir frying it. Now add the cooked pork, peas, and sliced green onions. As I mentioned I had leftover shredded pork to use for this recipe but if you don’t any leftovers and want to make it from scratch, here is my recipe pulled pork (skip the barbecue sauce, of course). For a shortcut, I suggest buying precooked pulled pork from the grocery store or Costco. 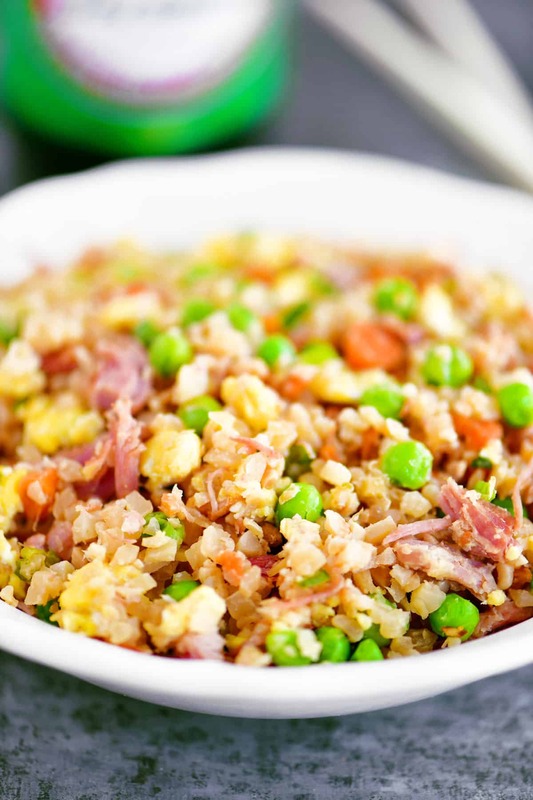 After the pork and peas are hot, make a well in the center of the pork fried cauliflower rice and add the beaten eggs. Stir and cook them in the center and before mixing them into the fried rice. 1. Can the make this recipe with regular rice instead of cauliflower rice? Yes, you can substitute equal amounts of regular rice for the cauliflower rice. 2. Is cauliflower rice better than rice? That really depends on which factors you are looking at but overall I feel that cauliflower rice is a better option than white rice. Here are the nutrition facts for one cup so that you can compare. One cup of cauliflower rice has 25 calories, 5 grams of carbs, 2 grams of fiber, 1.9 grams of sugar and 1.9 grams of protein. One cup of white rice has 205 calories, 45 grams of carbs, .6 grams of fiber, .1 grams of sugar, and 4.3 grams of protein. 3. 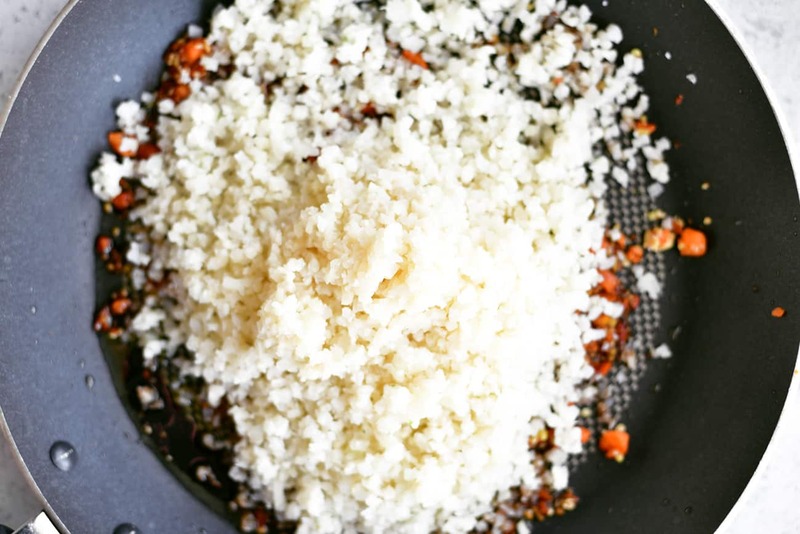 How do you make cauliflower rice? It super easy! Here is a link to my recipe for cauliflower rice. 4. Can pork fried cauliflower rice be frozen? Yes, you can freeze the leftovers in an airtight container and reheat in the microwave. 5. Can I make this without the pork? Yes, you can leave the pork out and just have fried cauliflower rice. 6. 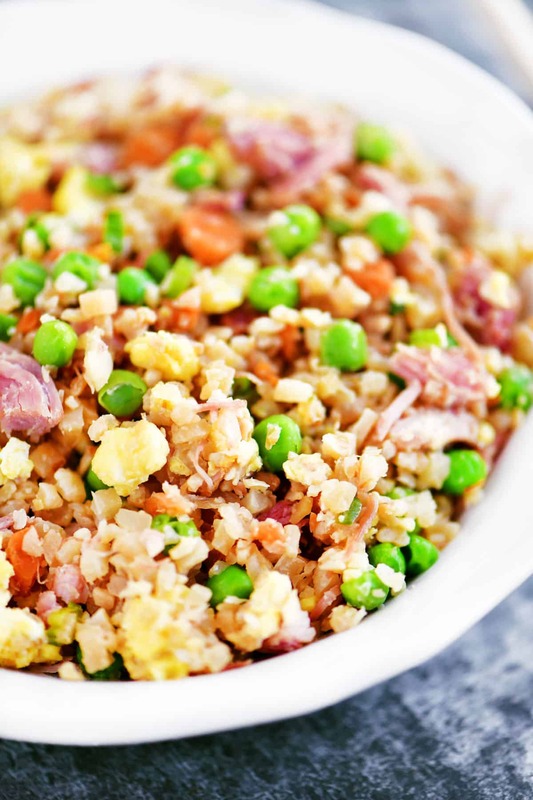 Is pork fried cauliflower rice gluten-free? To make this recipe gluten-free, you would have to use a gluten free soy sauce or substitute the soy sauce with something like coconut aminos. This Chicken Alfredo Spaghetti Squash recipe is low carb comfort food that is easy to make. Your family won’t even miss the pasta! A quick, easy Chicken Stir Fry is the perfect family dinner for busy nights. You can substitute beef for the chicken and rice for the noodles. I love that this One Pan Lemon Chicken with Asparagus is done in only 10 minutes! A great way to use leftover chicken or make with rotisserie chicken. This Beef and Broccoli Recipe is easy to make and more delicious than Chinese take out. It’s a family friendly 30-minute meal everyone will love. 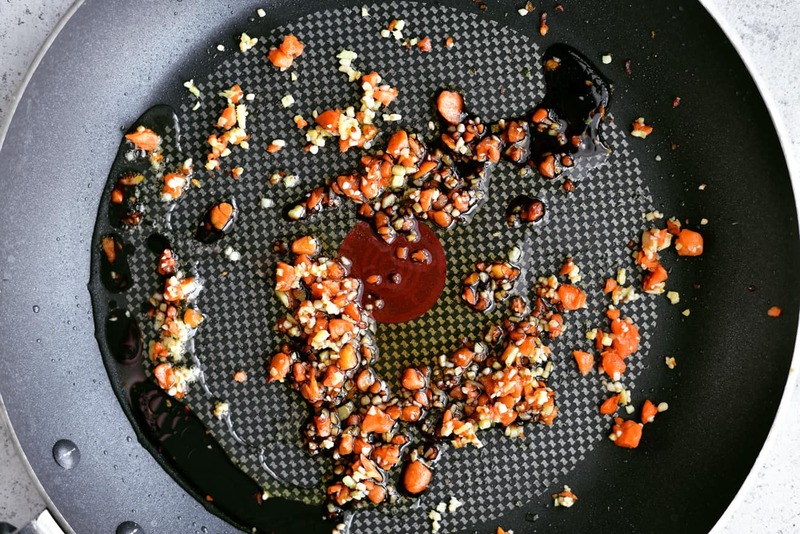 Heat one tablespoon of olive oil in a large non-stick skillet over medium-high heat. Add the minced carrots and cook until tender. Add the minced garlic and ginger. Cook and stir for one minute. Stir in the remaining olive oil as well as the soy sauce and sesame seed oil. Add the cauliflower rice. Stir fry for 2-3 minutes. Add the cooked pork, thawed peas, and sliced green onions. Stir fry for 2-3 minutes. 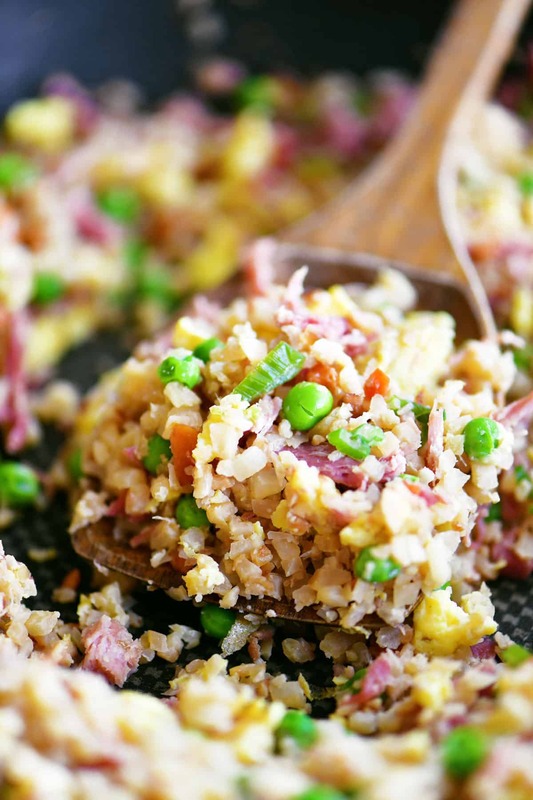 Make a well in the center of the pork fried cauliflower rice and pour in the beaten eggs. 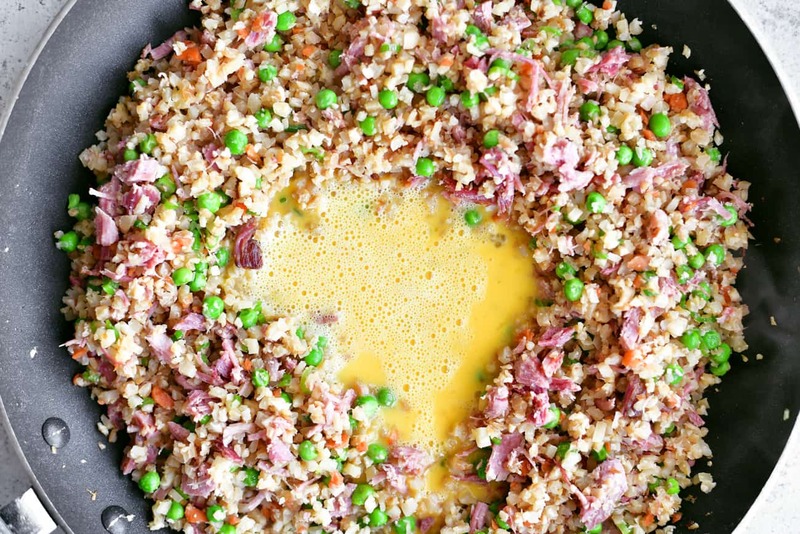 Stir and cook in the center and then combine with the fried cauliflower rice. See blog post for tips, shortcuts, and answers to FAQs.